When holidays roll around, it's easy to forget our healthy eating habits. But you can help children see that good nutrition can be fun! 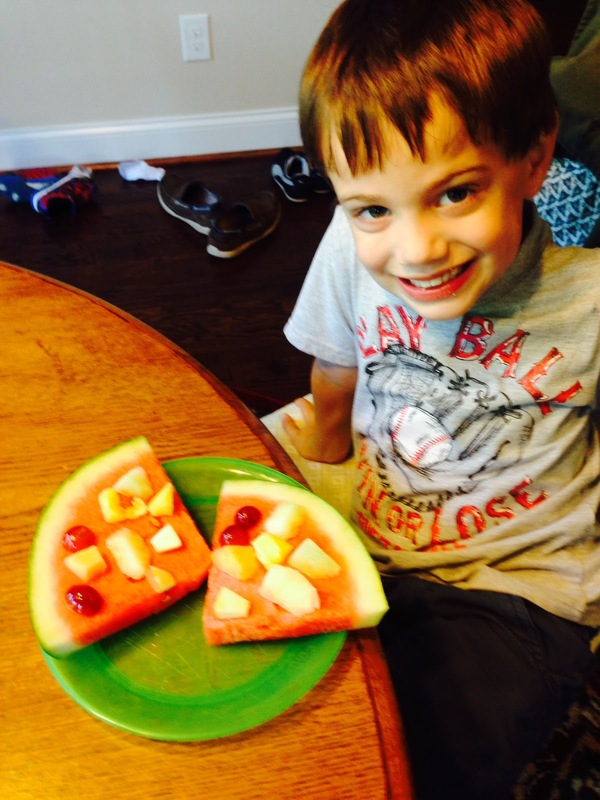 One child-friendly snack preschoolers can help to make and eat is a Fruit Pizza! Remind children that fruit is a food that is good for us. Families can involve children in food shopping by encouraging them to look at the fruit section of the store to choose favorite fruit. Classrooms and summer camps participants could fill a bowl with fruit from a "salad bar" set-up outside or in the classroom. 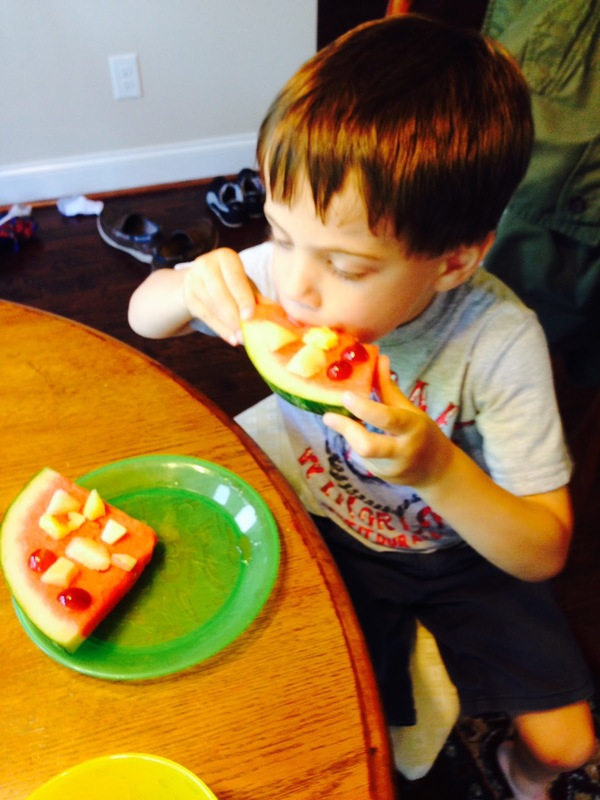 Then give each child one or two slices of seedless watermelon, cut in a triangle, like a pizza. Let each child plan the creation of his or her fruit pizza slices. 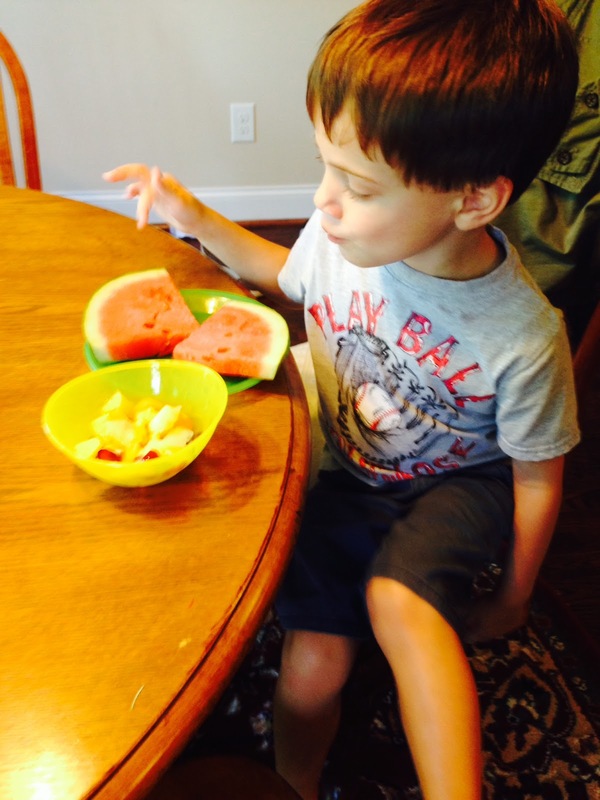 Children can practice saying the name of different types of fruit and describing them as they place pieces on the watermelon. Finally, comes the best part - enjoying a healthy summer holiday treat! NAEYC - 2.D.03, 2.K.01, 2.K.02. Head Start - I.B.5, I.D.2, VIII.B.2&3. Numbers are important for children as they enter school. While it is necessary for our preschoolers to count in sequence to 20, we also need to help them recognize numerals and understand numeracy. This goal can be meaningful and fun. One “game” you can play to help children is to use (recycle!) 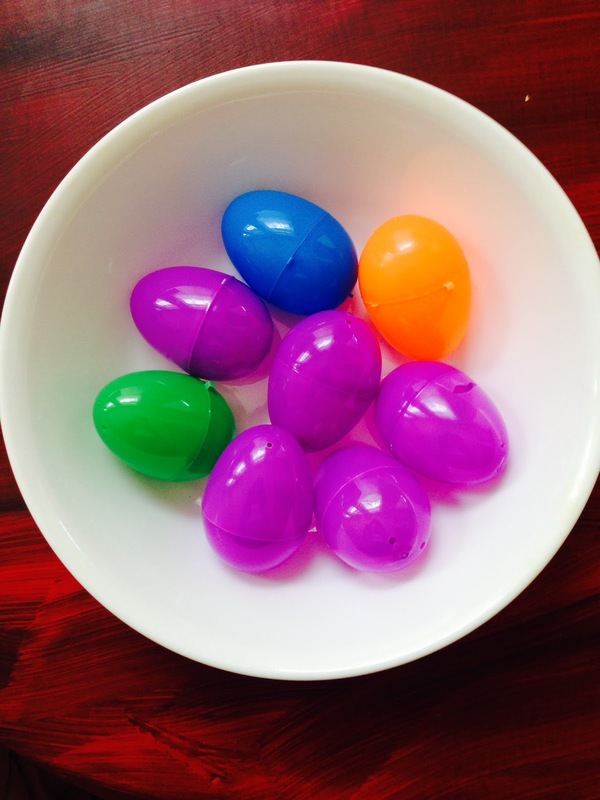 old plastic eggs. We used a permanent marker to write numerals on each egg. 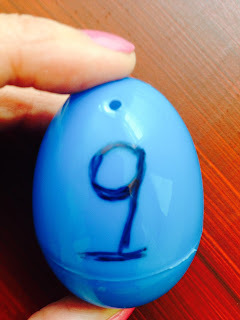 Note that we put a line under the numeral so children would know which way to look at the egg. This is especially important for 6 and 9. You can put the eggs in a bowl or bag and have children pull out an egg and say the numeral on it. Celebrate when it is “read” correctly. We also like to encourage children to collect small items while on a walk or playing in the yard. These can be used as part of the “game” and they help to show children that we don’t need to buy things to learn and have fun. Small pebbles were collected and put inside the eggs. The child chooses an egg, says the numeral, and then opens it. 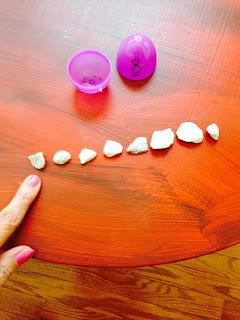 The pebbles are put in a line for the child to count, as shown below. This gives number meaning to the numeral. Note that we include 15 as this seems to be one of the most difficult numerals for children to say and recognize. Be sure to have children point and count from left to right, the direction we read. 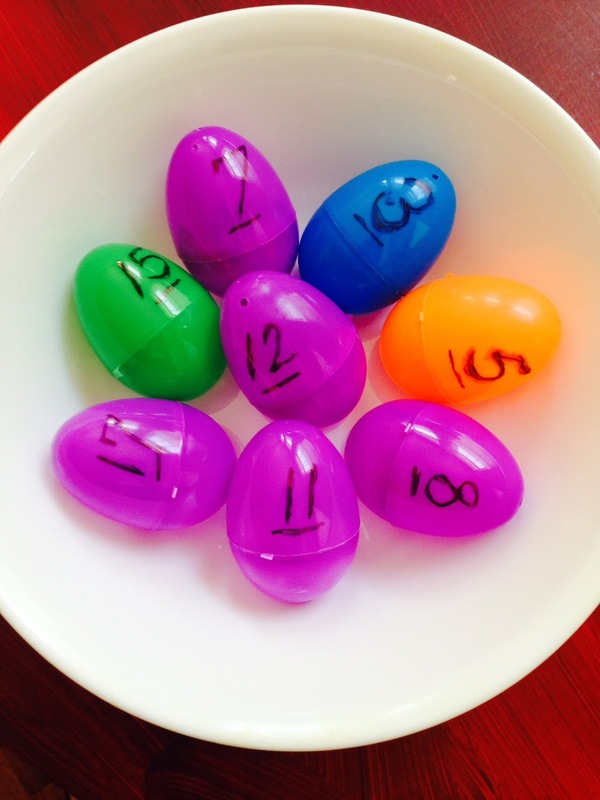 Finally, have children choose an empty egg and fill it with the stated number of items. This is the highest order of mathematical thinking. The child must recognize the numeral and match the number of items to the numeral. In this seemingly simple “game” there are 3 necessary learning objectives: recognizing and saying numerals, meaningful counting , and matching items to a numeral. 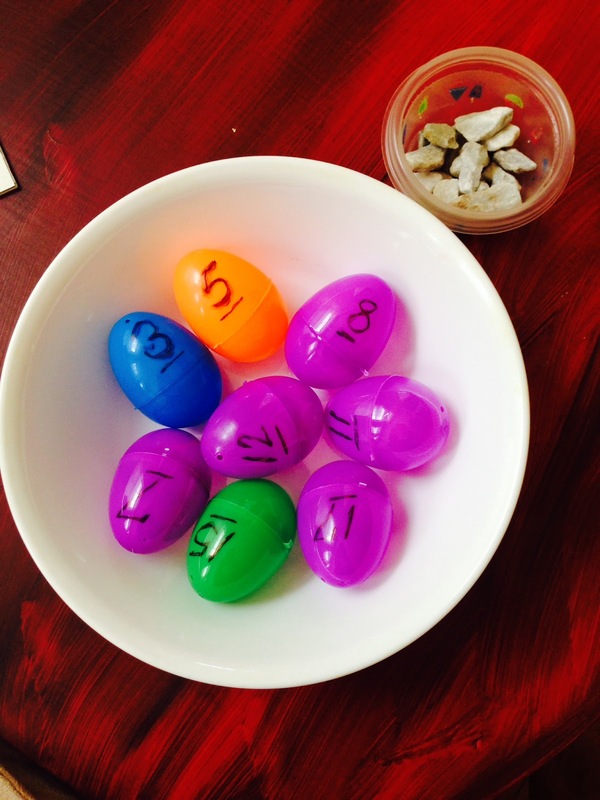 This helps children develop number sense! NAEYC - 2.F.02, 2.F.04, 2.F.11. Head Start - X.A.1, X.A.2, X.A.3, X.A.4, X.A.5. School Readiness: Text Features, Concept of Word. Fluency, and MORE! Read, read, read to children! We know that is the best way to encourage literacy and a love for books. But as you read, can you help prepare for literacy concepts they will encounter in school? These short videos based on the book, Brown Bear, Brown Bear What Do You See? by Bill Martin, Jr., illustrate what we can do to promote school readiness as children copy what we do as we read. Be sure you show children the cover of the book, the title page, and read the title and author. As shown below, this child has heard the name of the author and knows to "read" it with just a little prompting. We love that he ALMOST got the name of the author correct. This shows that children do not have to say everything exactly right. At this age, the goal is to understand the meaning of what an author does and to acknowledge an author's importance. The next clip shows this child has seen family members point to words as they read. You will notice he also points to words. This helps develop a Concept of Word, a key school readiness skill. The child is also familiar with how the text is read and mimics that expression. This helps develop fluency skills. Finally, note how this child tracks the animals the children see at the end. He moves from left to right on each line and makes a return sweep at the end of the line to the next line. This is another important readiness skill. You can see that when adults read with expression, point to words, and show features like the parts of a book and the name of an author, this helps children develop school readiness skills. NAEYC - 2.B.04. ; 2.E.03. ; 2.E.04.;2.E.08. ; 2.E.09. Head Start - II.A. ; VII.A. ; VII.D. The Library: A Perfect Preschool Visit! Libraries are the perfect summer “field trip” for families, neighborhoods, and even for childcare centers and day camps. Getting a library card is free and easy. This provides our children access to a wealth of reading material. We all know the studies that show children with greater access to books are better readers. What better way to give children books than to visit the library on a regular basis? And remember, libraries have lots more than books! They are places that parents, grandparents, aunts, uncles, and other friends can take children on a hot or even rainy summer day for added fun. Most libraries offer computer time, even to our youngest children. Special programs invite children to explore book characters, read-alouds, and plot related games. Quiet corners provide space for children to cuddle with a much-loved book. Libraries want children to feel welcome and often offer puzzles and blocks that stimulate the mind and make children feel this is a place just for them. So, “check-out” your local library this summer. We are sure there will be lots to experience! Head Start - II.A. ; V.A. ; VII.A.